Simplify your life. Save time and money with leading business communications systems and network services. Get peace of mind with NYC’s outstanding 24x7x365 customer support from Alpha Computer Group. Small businesses and leaders in the public and private sector turn to Alpha Computer Group for innovative technology. Find out why over 25,000 customers depend on us for affordable voice, data, carrier, and video solutions. Get cost-saving voice, data, and video applications that can improve your operations and help you beat the competition. Count on our worry-free installations, warranty programs, and expert technical support. We offer both on premise and cloud phone systems for NYC. More than a hosted PBX, Alpha-Cloud is a full-featured Unified Communications (UC) solution designed for SMBs. Now you can take advantage of powerful UC features, including presence, instant messaging, conferencing and mobility all for a low monthly rate. See for yourself how our Cloud simplifies the way your business communicates, anywhere, anytime. Our experience and engineering gives your company a robust UC feature set without the hassle and expense of complex licensing models. All phone system features are included for every user! No longer do you have to worry about the added expense of feature licenses if one of your staff members needs more functionality. Have a newly promoted employee who now needs to record calls? Great, just click a button to turn it on! The features set provides many products under one license. Traditional phone systems would require individual feature licenses for major applications like voicemail, faxing, and and IVR’s. With Alpha Computer Group, your company can simplify its communications down to one powerful solution delivered in the cloud or on-premise. Get mobile apps, call recording, desktop faxing, ACD, presence and much more all in one turnkey solution-all in one price. With our hosted cloud technology, you can make calls on any device with an internet connection. Imagine getting a phone call on your office phone then seamlessly transferring it to your mobile phone while you head to a client meeting. You can take your business phone number, chat and voicemail anywhere with our smartphone app. Our hosted PBX phone systems are tailored to fit modern business needs like speed, mobility, and reliability. With them, you can increase your productivity and work from anywhere so you can get back to business. Alpha Computer Group provides the latest technology in phone systems for those in the NYC area. We have all kinds of business services pertaining to communications, including a cutting edge VoIP phone system. 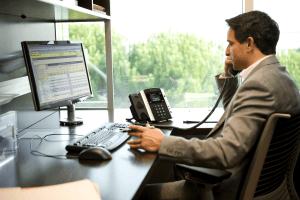 As a phone system provider, we can guarantee that we have what you’re looking for. We provide the best Business phone systems NYC offers. We proudly offer our services to the entire state of California. We are notably one of the top VoIP providers, and hope that you will call today to find out more about the benefits of using Alpha Computer Group as your sole VoIP services provider. There are great Mitel solutions out there that can continue to grow and expand your business. Alpha Computer Group is pleased to offer them to you. Alpha Computer Group offers affordable NYC business phone systems, and specializes in Digium products including the incredible Switchvox product line. We design NYC Digium Switchvox PBX systems, that can help you save money with an Asterisk open source solution. Our NYC Asterisk Phone Systems offer an affordable call center solution, without expensive license fees for adding new features. Alpha Computer Group is proud to serve the United States and Canada, offering NYC business phone systems including Asterisk PBX and Digium Switchvox. Our NYC Asterisk phone systems are capable of running large operations including call center phone systems numbering up to 500 seats. With a full range of features and the latest in SIP compatible PBX solutions, you will have greater flexibility with integrating with existing applications combined with the perfect combination of powerful and affordable solutions for advanced business requirements. Get more information about how our NYC Asterisk phone systems can maximize your business power, control, and flexibility by speaking with one of our agents today. Not only do we conduct custom Asterisk builds and programming, we can also provide you with expert consultancy on several types of NYC Asterisk phone systems. We can demonstrate how you will benefit from this powerful open-source software-based PBX. With Digium Switchvox, your NYC business phone system will be able to take full advantage of advanced Unified Communications tools by utilizing a beautiful graphical interface that makes administration simple. Unlike some other business phone solutions based on the Asterisk platform, NYC Digium Switchvox not require license fees for every feature. In fact, most popular business features will be built into your base NYC Asterisk phone system. Contact us today, and let the experts at Alpha Computer Group help you with your NYC Business Phone System @ (877) 608-8647. We have been working with Asterisk in NYC for over 10 years in Enterprise and Small Business networks. We have more registered Asterisk installations than anyone else in NYC. We have helped leading NYC companies implement Asterisk both in house and in the Cloud. We can help you with whatever your Asterisk environment maybe, simple or complex. We offer support contracts for your NYC Asterisk installation. This ensures you get the optimal performance out of your open source software, and is necessary for any technology that you run your business on. Now that you have the confidence of a support contract from StrategIT for your NYC Asterisk installation, sit back and relax. Let us do the work for you.